Astarium is an atmospheric symphonic black metal band from Novosibirsk, Russia. It is the solo project of SiN who started them back in 2005. Since its first demo in 2006, the band has released countless works, including 4 full-length albums, several EPs, singles, demos and splits, many of which were re-released in various versions. 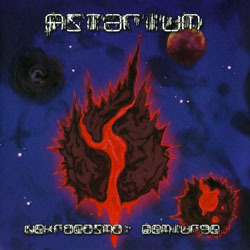 During December 2013 and February 2014 Astarium recorded their latest EP “Nekrocosmo: Demiurge“, which was out on June 2014 as a collaboration between the Russian labels Margin Art Records and Dark East Productions. “Nekrocosmo: Demiurge” is the first part of a trilogy that will be dedicated to space themes, a concept that has also affected the band’s sound. While some of their previous albums had a darker and more “evil” atmosphere, this new work has a more melodic orchestral approach. The EP contains 4 tracks (2 of them are instrumental) with a total duration of 20 minutes, plus the 9-minutes bonus track “Obsessed by Astral Hunger” taken from their 2010 album “Dethroned of Impostor“. Astarium play symphonic melodic atmospheric black metal and their music is dominated by majestic synths and melodic keyboards. Distorted guitars and raw screaming vocals of an underground sound aesthetic give the needed “heaviness” to their music, creating a very interesting balance in their overall sound. The production is quite good serving perfectly this style of music. SiN has composed many wonderful melodies in this EP that can travel the listener to oniric space journeys. For my personal taste the 4 main tracks are better than the bonus track and I hope Astarium continue this space thematology, composing something more complete in the future, trying to keep the interest of the listener in a full album. The lyrics of the 2 main songs are written in English and you can find them in the CD booklet. If you are into synth-based melodic black metal, Astarium is a very nice recommendation. They don’t add something groundbreaking to the genre, but they offer 4 beautiful melodic atmospheric songs. “Nekrocosmo: Demiurge” is a joint release of Dark East Productions and Margin Art Records and it comes in a standard jewel-case CD edition limited to 500 copies, including a 4-page booklet illustrated by Viktor Zhdanov. You can visit the band’s official pages below for more details and sound samples.